“Oh Oh”…how we love you so! Yellow Goat Design’s latest light fixture now suspends proudly at an office building located 7 miles south of San Francisco and 7 miles north of SFO (lots of “7’s”…must be lucky!). The office building is over thirty years old but is definitely not showing it’s age! Design Blitz, located in San Francisco, gave this space a facelift by gutting and renovating the prior R. Dakin Co headquarters (a plush toy manufacturer). The team, inspired by the bay and surrounding mountains, incorporated bold shapes, natural materials and jaw-dropping views to reinvigorate the property and inject some playfulness into the interior. Playfulness, luckily, is YGD’s forte. We worked together to offer ideas that fit the aesthetic (and the budget). After several rounds, the “Oh Oh” was selected to give the interior it’s own M.O.! 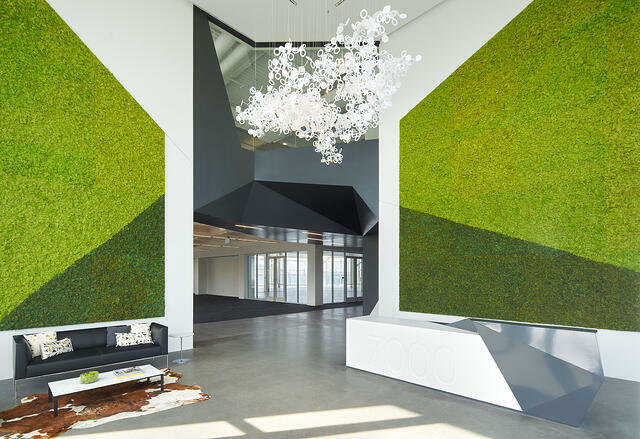 The fixture, measuring 7’-7” x 6’-7” high, is installed in the lobby against two lush green walls and a sleek front desk design. It is built from opal polycarbonate elements in a gloss finish and suspended via stainless steel cables from a mirror composite ceiling plate. YGD’s go-to 1.2 watt LED bi-pins (20 to be exact!) are scattered amongst the fixture and add that extra punch of reflectivity and dimension. The color temperature shown is a warm 3500k and the LEDs are dimmable to give the tenant flexibility in the light output desired. We’re OH so glad Design Blitz included us in this “California cool” commercial campus (say that 7 times fast). Thanks to all for the collaboration! Ready to transform your office space? Drop us a line at sales@yellowgoatdesign.com to get started.